And suddenly both of them are in far deeper than they’d planned. Ethan doesn’t expect Audra to affect him so profoundly, and when she begins to, he’s terrified of the pain he’s felt before when someone he loved was seriously injured on his watch. He’s determined that his new wife will do as he says so he can keep her safe from the dangers that lurk on their ranch. Audra has been cared for all her life by one man or another–and they’ve done a poor job of it. Now she’s planning to stand up for herself. And her new husband had better agree or get out of her way! This is the second book in the Kinkaid Brides series by Mary. While not strictly necessary to read Out of Control first, those who have will understand some of what’s going on a bit more readily as the storyline picks up just days after the first book ends. Ethan agrees to marry young mother, Audra, but has little understanding of what it means to be married. Other than his parents’ poor example, the only real “role models” he has is his older brother – who is married to Ethan’s new wife’s step-daughter and has been for a whopping few days. Audra is coming out of an abusive marriage to a man who cared more about his “cover” than he ever did about his wife or daughters. She’s tired of men running her life and agrees to the marriage only because she has to protect her girls. That’s not really surprising since I’ve loved every Mary book I’ve ever read [and I love Mary, too, but that’s neither here nor there ;)]. I had surgery last week. More on that another day, but I needed something fun and not too heavy to read and Mary’s book fit the bill. I even made the hubby drive around town to find it [I couldn’t! I was on narcotics!] =D. Ethan and Audra are wonderful! Ethan is wonderfully clueless about marriage and Audra is wonderfully willing to be wrong about marriage. Eventually. Her two little girls are adorable and I’m always impressed with how much Audra in particular, but Ethan and the others, too, are able to get done with a baby/toddler in arms. 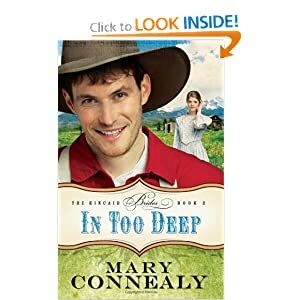 I think Mary has been taking lessons from Julie Lessman because there’s much more kissing in this one – and they were wonderful, too :D.
Ethan has spent his life avoiding caring too deeply because when you care you can get hurt. Audra and the girls are about to make that impossible for him. Audra has to learn that sometimes it’s okay to let the man in her life take care of her – because this time he’s worthy of her trust. And when they finally allow themselves to feel everything for each other? Well, it’s wonderful. Even the bad guys – and especially, the bad gal – are well-written and worthy of a Mary Connealy plot line. They’ve got their work cut out for them with the Kinkaid brothers on the other side. And the Kinkaid brothers won’t just roll over. One of the other things Mary did wonderfully well was to use a geographic feature as a character in itself. The cavern is amazing as it comes to life – in the present and in the memories of Ethan and his brothers. It would be a wonderful place to see in a documentary/docu-drama on Discovery or the Travel Channel – but I don’t know that I’d be comfortable exploring it :D.
This review has been brought to you by the letter W and the word of the day – wonderful. Seriously, girl.You’ve talked a bit too much about the narcotics. 🙂 Thanks for the nice review. God bless you. Hehe. How often do you get to say you’ve been on narcotics and not have the DEA after you ;)? ❤ you! And August is still waaaaaaaaay toooooooooo far away!